Episode 11 is up for download at CLAMP no Kyoto Agaru Sagaru‘s official website. They spent the first 5 minutes talking about X because of an e-mail sent by a listener asking them about Kamui’s settei blood type. 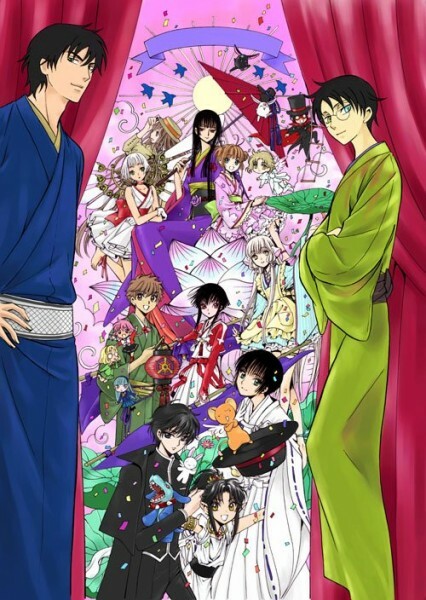 Then, they read another e-mail which asked CLAMP to talk about their latest collaboration with Suga Shikao and XXXHOLiC. Basically they talked about the experience of drawing a comic based on a song. Mokona said she had a lot of fun drawing the storyboard and I think she said something about being similar to CLOVER. Ohkawa mentions that the main drawing and inking in XXXHOLiC are done in analog format while finishing is done digitally using Photoshop (I would like to hear more about this…). Then, they go into a long talk about glasses (reading glasses, round glasses, sunglasses, Suga Shikao’s sunglasses). The show has a new Ending Theme song performed by Iwao Junko called “going“, which will be included in her upcoming new album “Return to Myself“. -They first speak about how Kyoto is warm even though they are entering winter nowadays. -Nekoi reads listener’s message: The listener has a fetish with characters blood type, and he/she says that is always having fun trying to guess the blood types of the characters when reading and trying to verify the actual blood types later to see if he/she was correct. So he/she asks about X’s Kamui character. He/she thinks Kamui is pretty much a typical B type, but is that really so? He/she also ask CLAMP to tell the blood types of other X’s characters. -Ohkawa immediatly surprises that Kamui could be think of as a B-type person. Mokona says that she relates B-blood type to Oka Hiromi (famous old manga “Ace wo Nerae!”main character). Being this character the kind of person that has a clear goal to achieve and all her efforts are aimed to achieve that goal, so she doesn’t really think of Kamui as a character with such profile. -Nekoi says that is not because of the blood type, and that is because she is a girl (a girl fighting her best I assume she means). -They also mention Kitajima Maaya, a character of the famous manga “Garasu no Kamen” being a B type kind of character. -So Ohkawa clears that Kamui is not B-type. So the rest of them starts to guess and finally Satsuki says it was A-type, and Ohkawa confirms this. -Ohkawa says that it may appear like a O-type character though. And Satsuki says that the image she has about A-type -including herself- is sort of an irresponsible type of person. She says that she hasn’t seen any A-type steady/firm/sure of himself. -Ohkawa says that she thinks of O-types as kind of annoying, and lovers of cleaning and order. But of course this may be just based on their own prejudice, since 3 of them are A-type and just 1 is O-type. With this kind of combination The O-type one is surely having a hard time. -Satsuki says she shouldn’t be saying that and Ohkawa replies that she thinks this way pretty much about the group as well. So they start talking about the the usual exchange they have every day, somebody is being asked to wait when visiting the home of the other, or when someone asks Mokona if it’s ok to take the day off, she replies telling to take off the day after tomorrow better, and that sort of things. Ohkawa says once Satsuki said to her not to come (to her house I suppose). So Satsuki said they can meet in other places it doesn’t have to be necessarily on people’s home. And Ohkawa clears up that in those days there were so much books inside Satsuki’s home that you couldn’t physically enter. Pilled up on like towers. So this is the kind of things O-types do. You can go to Nekoi’s house anytime and she won’t be mad about it (says Okhawa). Nekoi may tell you is not really ordered but it isn’t that much of a mess – and Nekoi comments that the little garbage is on purpose, so the cat can play with it. -So Okhawa says, if you think of Kamui’s home, it may be in part well ordered and clean, and in parts wildly untied. And Fuuma’s place would be clean. And since A-types like to decorate with the stuff the like/hobbies stuff they show it, but O-types tend to hide it. -Ohkawa mentions Sorata was B-type but she really doesn’t remember having published this data of each character, so Satsuki reminds her that it was published on the Materials Book of the anime series. -Around minute 6 they started talking about Suga Shikao’s new song and the special one shot. -On this one shot there are not much dialogue globes. Which is pretty different to how XXXHOLiC is normally. So at drawing stage it gave them the feeling of drawing shojo manga because this is a typical narration technique on Shojo manga (not having that much dialogue globes). -Ohkawa says that at the storyboard stage it looked a little bit like CLOVER since the premise was that the art will be used as some sort of illustration. So when they passed it to the editors, they passed a plain line only version, a version without the places (textually “frames”) to put the lyrics, and a final version with the lyrics and all. So it was a lot of work for Nekoi to save all the data (image files in this case you may think) by separate. – Ohkawa continues saying in the case of XXXHOLiC, is basically analog drawing until pen-inking stage only. And the finishing is digital. -They actually name the software as Photoshop (they say the company name at min 9:49 but I could really connect it to a known software name, they say something-something-MAX Photoshop). They do say clear not to be using Studio Comic though and also mention Clip Studio. -Ohkawa explains that in the old days was all manual processes, but that now, even though they draw the lines manually they input on the computer once and used within the software. So this makes the tasks easier and quick. In the old days they had a lot of trouble with having no time to do the final lining. -But on the other hand, now they sent the chapters digitally (by e-mail or uploading to storage cloud) so they can not excuse themselves saying the bike guy was slow. -So this time they sent 3 versions. They have watched the YouTube preview but they still didn’t know at that time how it was going to end up so they were eager to know. -Mokona says that from now on they should draw XXXHOLiC always listening to that song, and Ohkawa added that felt like a persevering kind of feeling. Mokona said she liked it. -Ohkawa also mentions that it has been a long time since they didn’t draw actual-Yukko (meaning not Memmories-Yuuko). At firsts starts with Yuuko going to the shop and then the story focuses on Watanuki. So the first part is not like a dream or a memory, it appears the Student-Watanuki and all. -It appears that every time Watanuki appears on scene Nekoi asks which glasses should draw (hahaha). The glasses broke once, and also when he takes in charge of the shop the glasses become more circle-shaped (rounded). Those are the ones Clow left on a box. Episode 2 is up for download at CLAMP no Kyoto Agaru Sagaru‘s official website. This episode’s topic was Magic Knight Rayearth! memories from the time it was serialized in Nakayoshi. the time Ohkawa and Nekoi were guests at a radio show where Shouko Nakagawa was one of the MCs (hostess) and she was a fan of Rayearth, particularly of Umi. Mokona talks about making the storyboard for the TV Anime Series opening. As usual, if anyone would like to share their thoughts about what they talked about, that would be highly appreciated, even a brief summary would help! They were right, so far I am enjoying these more than their 2007-2008 internet radio, Komugikotoride no Yonshimin (from CLAMP-PLA.NET), in which they rarely talked about their works. 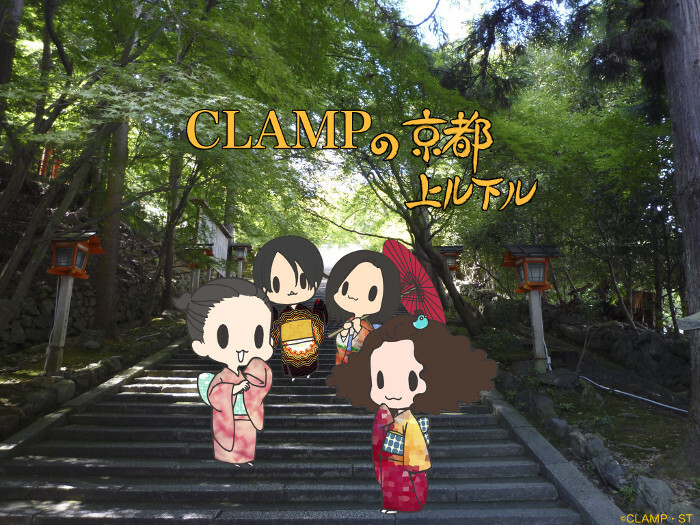 As part of the “Kyoto International Manga Anime Fair 2013”, a CLAMP art exhibition to be held in Kyoto has been decided. The exhibition will run from September 6 to 8 at the Kyoto Computer Gakuin, in Kyoto. Original illustrations from Magic Knight Rayearth, Card Captor Sakura, Tsubasa, GATE 7 and XXXHOLiC Rei will be on display, as well as the illustrations that CLAMP did for the Card Captor Sakura mobile game and the serialized novel, Haken Anime!. There will also be screenings of the anime adaptations of Magic Knight Rayearth and Card Captor Sakura with special guests such as Naomi Tamura, Sakura Tange, Kumai Motoko and Junko Iwao. Admission fees: 900 yens for advanced purchases; 1000 yens on the days of the event. Very nice tip if you’re in Kyoto around that time 😉 I hope there will be pictures of this. And there are lots of them !